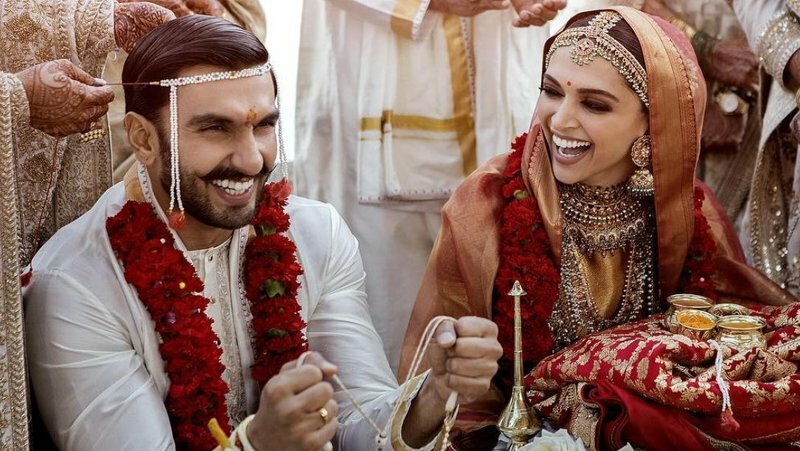 Bollywood stars Deepika Padukone and Ranveer Singh have released two official photographs from their wedding. Deepika Padukone and Ranveer Singh got hitched in a beautiful ceremony in Italy. Their nuptials were a private affair, with only close friends and family attending. Their traditional Konkani ceremony was held at the Villa del Balbianello in Lake Como, Italy on Thursday. Ranveer reportedly made a grand entrance, arriving by boat while dancing to some popular Bollywood songs. Deepika looked gorgeous in a red and gold traditional outfit. A special message in Sanskrit was weaved in her dupatta (long scarf). It read: "May you forever be married and steer away from the curse of widowhood embroidered onto it". The actors released two pictures from their special day. Some of the couple's famous friends took to social media to congratulate them on their wedding. Priyanka Chopra, who will marry Nick Jonas in a few weeks, described their wedding photos as "insanely beautiful". "Stunning," she commented on Instagram. Ali Bhatt commented with heart emojis before congratulating the couple on her Instagram Stories. Karan Johar wrote on Twitter: "Love and happiness forever.....these are such a full of pyaar wala pictures! For those of us who don’t have a life partner it’s a very “haiiiiiiiii” wala feeling!"